Download this white paper to learn how to protect yourself from today’s advanced threat landscape. Organizations need continuous protection and visibility from the point of entry. 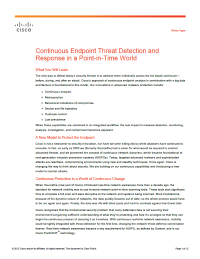 The Cisco Advanced Malware Protection for Endpoints solution helps overcome the limitations of traditional point-in-time detection and response technologies.